Gojee.com, the beautiful website that gathers food and drink recipes from the best bloggers in the world, has developed a gorgeous iPhone, iPod Touch, and iPad app that incorporates striking photography, unusual feeds, well-executed navigation, and customization options. You can create an account with your email, or you can log-in with a Facebook or Google authorization. The registration is simple and efficient. From the attractive home screen, you select drink or food. You are transported to a gorgeous photo with the name of the drink or dish and a star that can be marked with one touch to add to favorites. When you slide the name of the drink or dish with a gesture from the bottom of the screen, a list of key ingredients shades the photo. With one touch, you can share on Facebook, Twitter, or email. The other one touch option is to examine the full recipe. In an interface similar to Pinterest, the second touch on a photo leads you to the blog post for the food or drink. You remain inside the Gojee iPhone and iPad interface, and, from this point, you can again share to Facebook, Twitter, or email. It is an interesting choice that you cannot open the window in Safari, but it will certainly keep you engaged with the Gojee iPhone and iPad app. To access the full functionality, you use the sliding left menu or search bar at the top of the screen. The search bar is not the usual magnifying glass icon, instead it is the simple phrase, “I crave,” followed by a field for you to enter your search item or select from categories like rum, non-alcoholic, chicken, lunch, and more. The sliding left menu allows you to shift back and forth between drinks and food, access your favorites, and customize your searches. The search customization has a beautiful interface sorted in one touch for you to add dislikes and items on hand. If you want recipes with the champagne in your refrigerator, then you can quickly search through the exquisite, high quality recipes. You can also eliminate the frustration of identifying a great recipe that has one pesky ingredient. The fantastic selection of recipes is certainly the star of the Gojee iPhone, iPod Touch, and iPad food app, but perhaps the navigation star is the feed of recipes. 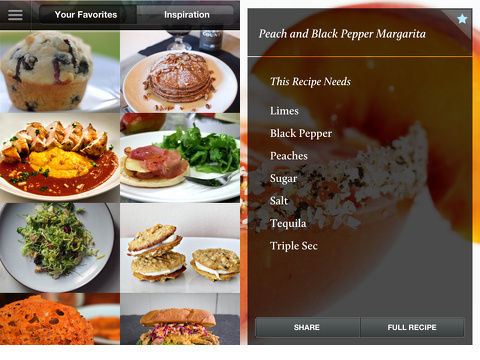 The screen fills with the photo of the drink and dish, and you scroll to the next recipe with horizontal swipes. The visual engagement created by this feed certainly reminds you that you eat first with your eyes. Even though the icon to access the left sliding menu and the option to search disappear from the screen, a touch on the top left corner forces them to re-appear. The Gojee iPhone, iPod Touch, and iPad app not only eliminates amateur photography and filters the mundane recipes, but it also inspires your Wednesday night dinner, boozy book club, and dinner party for the always brilliant price of free. 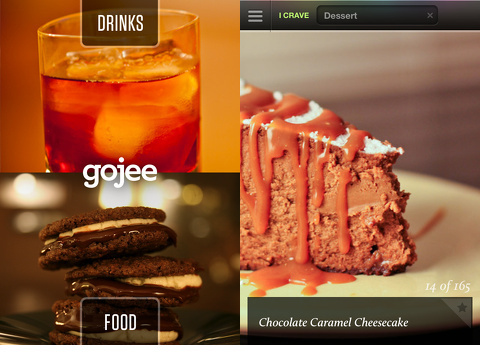 AppSafari review of Gojee – Food & Drinks Recipes was written by Jenni Ward on September 13th, 2012 and categorized under App Store, Food, Fun, iPad apps, Universal. Page viewed 5610 times, 2 so far today. Need help on using these apps? Please read the Help Page. Show, very good to know that you have an application like this, we lovers of cakes and sweets we will enjoy a lot. I loved this idea of ? ?joining the best bloggers in the culinary world.